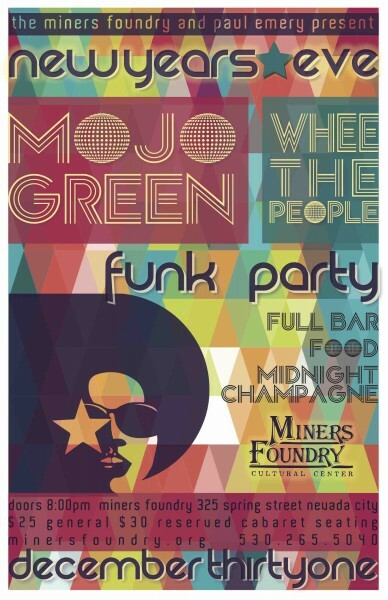 The Miners Foundry and Paul Emery Music present New Year’s Eve Funk Party on Thursday, December 31, 2015, featuring Mojo Green with special guest Whee The People. Doors open at 8:00 p.m. and the show starts at 9:00 p.m. Tickets are $25 for General Admission and $30 for Limited Reserve, plus ticketing fees. General Admission tickets are for the dancing section and are not guaranteed a seat. Limited Reserve tickets include cabaret seating. Tickets are available online, by phone, or in person at the Miners Foundry, or in person at Briar Patch Co-Op. Mojo Green is a seven piece, horn driven, soul funk machine playing high energy dance music, quickly becoming a Soul Funk household name. Sharing the stage with some of the nation’s top touring bands, Mojo Green has taken their high energy, hard hitting, crazy dance party to such storied venues as Sweetwater Music Hall and the Crystal Bay Club, plus major festivals such as Burning Man and the Hangtown Halloween Ball. Whee the People songs start with a foundation of Indie Rock and Indie Pop grooves, add a ton of Funkiness and Soul, and come to life with positive and uplifting vocals. With a funky, soul, horn section, sultry back-up girls, and hooky gang choruses, Whee the People is a journey for your ears. This entry was posted in Past Shows and tagged miners foundry, mojo green, nevada city, nevada county, new year's eve, whee the people. Bookmark the permalink.